I'm back in Bali (which feels blissfully familiar and easy compared to Nepal). I celebrated Aloha Friday exactly as it was meant to be celebrated - by doing absolutely nothing - and then eating. 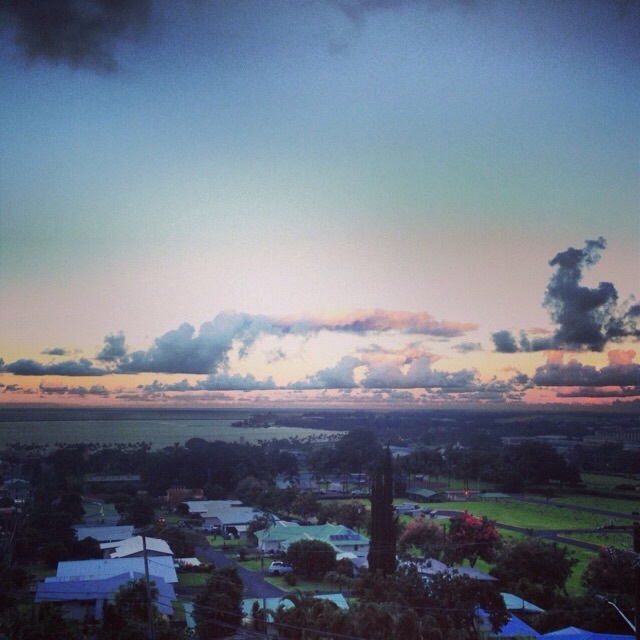 This also means there is no song for you....vintage instagram of Hilo Bay? It'll have to suffice - not quite Halloween-y is it? I hope you lovelies are enjoying your Friday wherever you find yourselves! This photo ended up being my favorite (as in I put it in my favorite pile because who can really choose a favorite?!). My Mom and I were walking along the rice paddies when I realized we were perfectly silhouted over the bright green. So naturally I stopped....and we struck a pose. I've got my skirt hiked up on one side with a palm tree on my left and my Mom's got her arms up vogue style. Mom and I strike a pose. 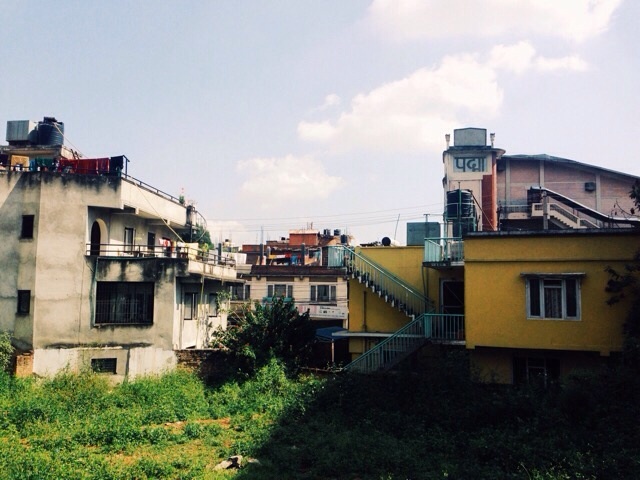 I woke up yesterday morning in Kathmandu which I must tell you felt quite surreal. Surreal on so many levels. I sat in a well appointed kitchen iMessaging with family. I ate muesli and drank french pressed coffee. 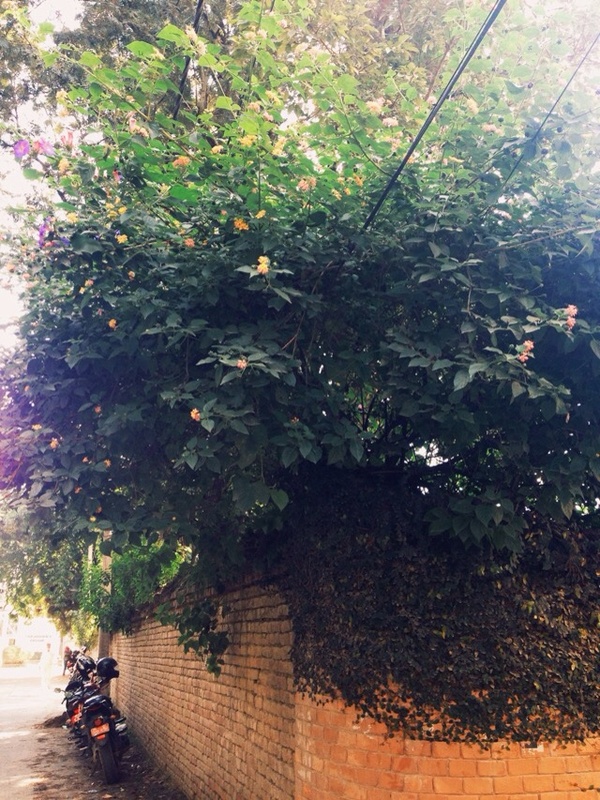 I could hear mopeds honking, bike bells dinging, dogs barking, birds chirping and neighbors hawking loogies. 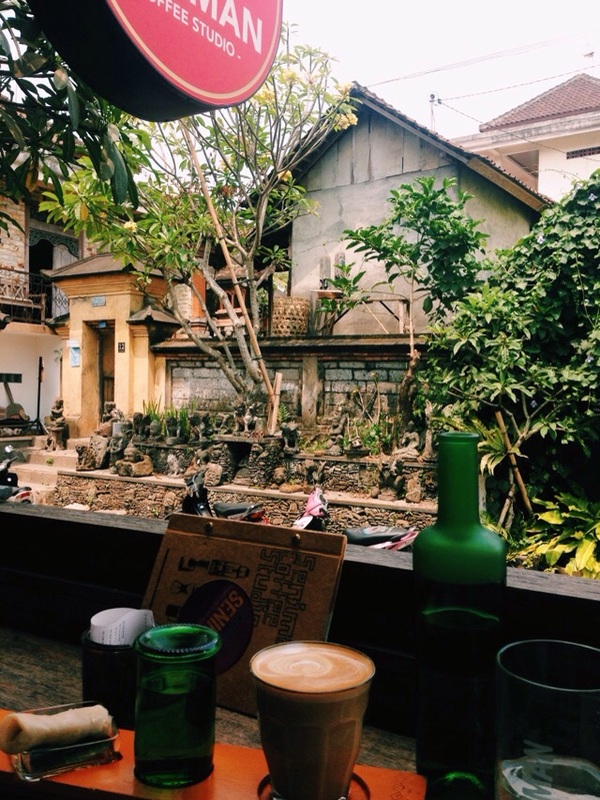 After being in Bali it all felt strangely familiar but, having creature comforts like delicious coffee seemed almost out of place. I had the day to myself and I must tell you, I'm not the best solo traveller. I get nervous to leave the house. I literally put on my clothes and shoes and then laid back down on my bed with my face in the pillow. Just laying there thinking about stepping out the door. I had to talk myself into it. Think about the photos you'll take. You can have a snack. Coffee! If you go outside and you don't like it you can turn around. The thought of leaving the safety of the house and courtyard made my gut clench. After awhile I start to feel ridiculous and it's usually this point in my solo forrays into the unknown when I begrudginly leave the house. Give me an hour and I'm like, 'yep, look at me - total badass - foreign travel - pssshhh...piece of cake'. The fact I left the house before 1030 was a major victory. On day one in Bali I didn't talk myself out of the house until late afternoon! Off I went, stepping over dogs on the side of the road. My iPhone out like a shield talking photos of my surroundings. My hostess (a friend of my cousin who is teaching at an International school here) had drawn me a map to a coffee shop. It fittingly featured a mural of coffee. Eye on the prize. Walking past colorful houses and clothes drying on the line is always a reminder that people live here. While I walk down the street taking photos, Moms are making dinner, Granmas are bouncing babies, Dad is off to work. This is just a regular day. I found myself on a little dirt lane wandering behind peoples houses. Mopeds zoomed past me and I had to back into a wall to let a truck pass. I was just on the brink of thinking, 'my map is broken' when I spotted my coffee shop. It always amazes me what you can find in an alley. If I think about my own home town my favorite restaurant is down an alley that must be very unappealing to tourists! It's sometimes strange to me how quickly I can go from feeling out of my element to feeling precisely in my element. 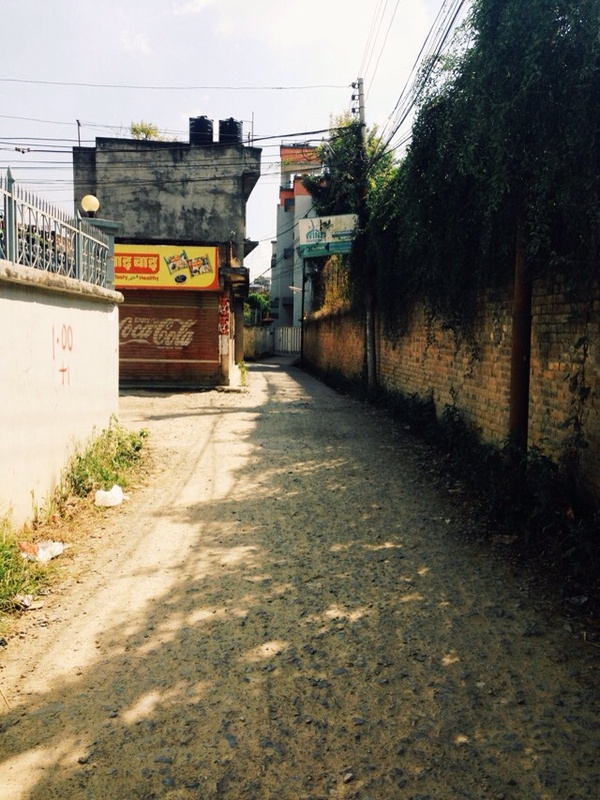 From a dirt lane in Kathmandu to writing blog posts in a coffee shop. I think in all my adventures the thing I've found the most universal is a cozy coffee shop or jumbled bookstore. Here's to new adventures! Here's to putting on your shoes and getting out of the house! Here's to street art! Bye Bali - I'll be back! I'm leaving Bali tomorrow morning headed for Nepal. I'm feeling a little melancholy-ish. 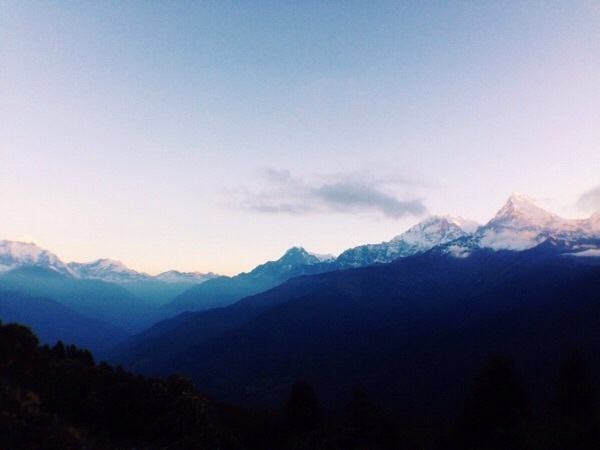 If it wasnt for the fact that I'm headed to Nepal I'd be crying into a pillow. 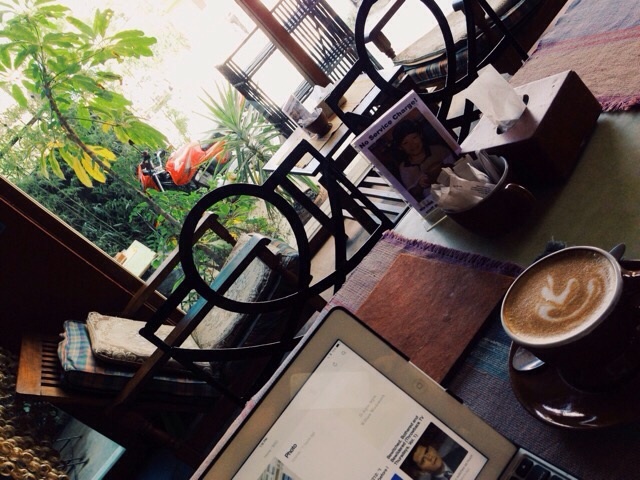 I'm sitting in my favorite coffee shop - reading a book about Nepal. I've just run the most basic errands. Post office - bookshop to trade in an old read - gift shop to pick something up for a friend. It all felt so normal. I realized sitting here that is be okay staying here. I could be comfortable - happy even. 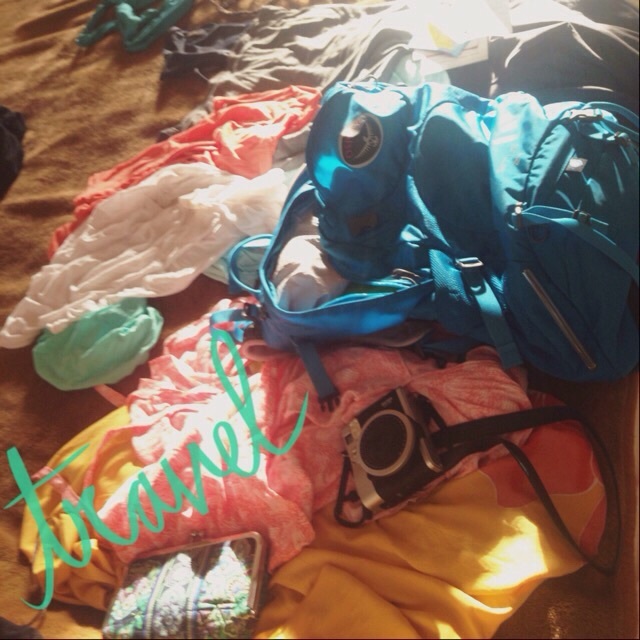 Its an interesting realization - that you're expat material. On one hand its freeing to know you could go anywhere and be happy. On the other hand you realize that it's gonna be harder and harder for you to go home. For now my mind says, 'give it a rest'. Just enjoy yourself. So I will. Plus, I come back in two weeks post Nepal. So there are more mellow Ubud afternoons in my future!